What happens to your car when you bring it to a body shop, and why does it take longer and cost more than other automotive repairs? When the value of your vehicle, its drivability and its safety are on the line, it takes a lot more work to fix than getting an oil change. These are the steps your vehicle will go through when fixing collision damage. The process starts with an appraiser that looks over the vehicle and documents the damage. Photos are taken of broken parts, and an itemized list of labor and component costs are put together. This information can then be sent to the insurance company. This initial estimate is only for visible damage: more damage may be discovered as the vehicle is taken apart. Before repairs begin, you need to agree to them. You’ll get a written estimate detailing everything that needs to be done, the cost of the repairs, and the estimated time to complete the job. The insurance company also needs to agree to the repair before they’ll pay. What about “totaling” a car? Regulations vary across the country, but in most states, including Wisconsin, a car is “totaled” when the repair costs are over 70% of the current market value of the vehicle. From there, you can file a total loss claim and have the insurance company pay for the value of the vehicle minus the deductible, while you sign over the title to them. If you want to keep the car, you can file for a partial loss. You’ll be paid less, but you’ll still have the car, albeit with a salvage title. From that point, you’ll have to pay for repairs out-of-pocket. This is the first step in repairing the vehicle. The car is taken apart, and new damage may be discovered. This requires a reassessment to be approved by you and your insurance company. The shop contacts you with information on these added repairs as well as the new cost and time to complete. This still counts as one repair, so you only have to pay the original deductible. Normally, when you have mechanical work done to your car, you wouldn’t think twice about using aftermarket parts. They’re often cheaper than factory parts and can offer similar or even superior performance. With body repair, even slight variations can greatly increase the amount of labor needed to get a part to fit. To avoid this, most shops will try to buy Original Equipment Manufacturer (OEM) parts, the same ones used to build the vehicle at the factory. If those aren’t available, they’ll usually source used factory parts before resorting to aftermarket parts. To get everything to fit correctly, the underlying structure needs to be fully repaired. Depending on the vehicle, the frame may be separate from the body, integrated into the floor pan or built around the entire chassis. Several points are measured and adjusted to bring the frame back to factory specifications. Even slight bends can cause problems with handling. The straightening changes the position of the wheels, so they have to be aligned to compensate. With the structure straightened, damaged body panels can be repaired or replaced. Panels have to be carefully shaped and attached to match the body design and get even panel gaps. Depending on the extent of the damage, either the affected areas will be painted, or the vehicle will need a complete paint job. The surface is sanded down and cleaned before being coated in primer, paint and clearcoat. Through this process, the panels are re-sanded to get a smooth, shiny surface. Mixing systems are able to combine ingredients to make a perfect duplicate of factory paint, but the color may need to be altered slightly to match the vehicle, which may have color variations due to wear and age. Body panels removed for paint or repair are fitted onto the car, as well as lights, wiring and other components that were damaged or removed before painting. The vehicle is then test driven to make sure everything is working correctly and there are no rattles. Once the vehicle is complete, it’s cleaned and polished, removing any sign of the repair work. If the repairs are done right, by this stage it should be impossible to tell the vehicle had been in an accident. 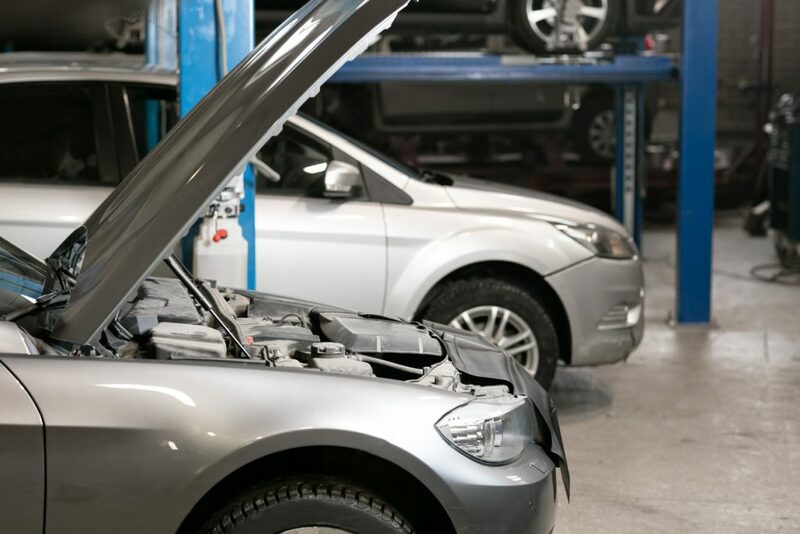 Merton Auto Body has the tools and experienced technicians to get your car repaired quickly. Our “keys to keys” cycle is usually under three days, and we have an on-staff appraiser who can work with your insurance company to get work approved. We also stand behind our work with a lifetime guarantee. Our shop is located just a few miles northeast of Hartland between Highways 164 and 83 on Moraine Dr in Sussex.